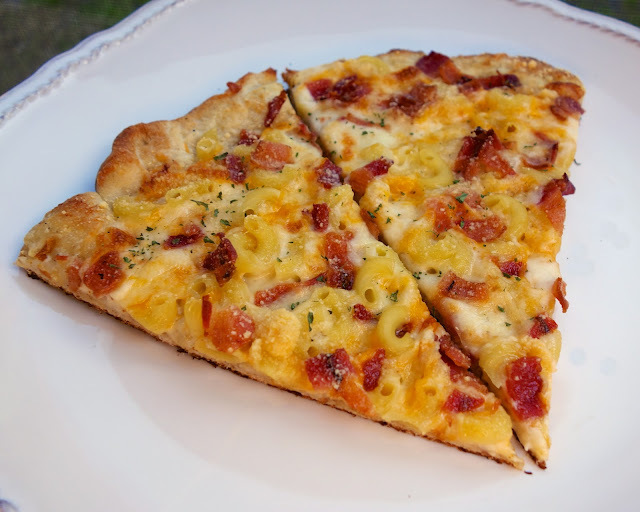 Macaroni and Cheese Pizza - alfredo sauce, macaroni, cheese and bacon pizza - SOOO good! Kids (and adults) gobble this up!! This recipe was inspired by a show on the Travel Channel. They went through the 10 best pizza places in the US. I am a pizza fanatic, so you know I couldn't miss that show. They showed some pizza that looked good and some that was just OK. The pizza I was most intrigued with was the Mac & Cheese Pizza. People were going nuts over it. I had to give it a try at home. The original pizza on tv was just crust, pasta and cheese. I thought it needed a little something more, so I added some alfredo sauce and topped it with some bacon. It turned out great. It was tasty and fun to eat. I think kids would go nuts over this! Unroll pizza dough and press into a circle on a lightly sprayed pizza pan. Spread alfredo sauce over crust. Top with cooked pasta, cheese and bacon. Bake for 12-15 minutes, until crust is done and cheese is bubbly. I swear---you must read my husband's mind. He would kill for that dish. This happens to be perfect timing since I have leftover Mac and cheese from last pm! 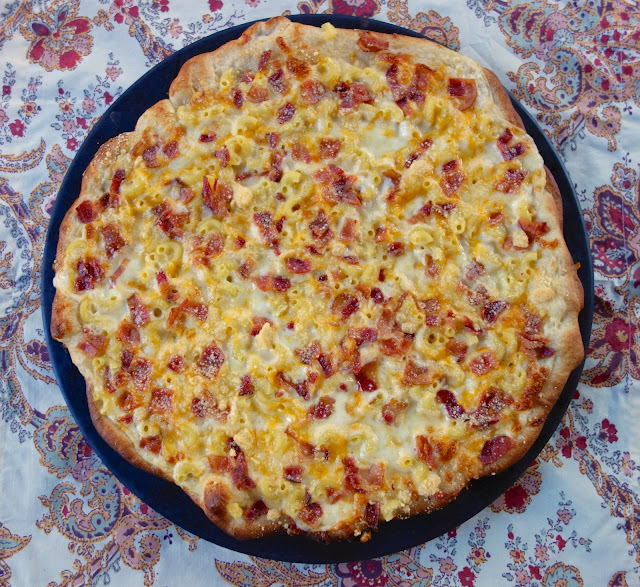 My kids love mac n'cheese pizza! We discovered it at a Fresh Market grocery store, and they were sold. I add bacon to mine as well, but haven't thought about Alfredo sauce. Did you seriously just combine the two most amazing things ever?! PERFECT! Made this on Saturday and my family insisted we have it again, so we are tonight. :), Thanks for a great tasting, super easy recipe. So glad I found your blog, War Eagle!